I’m a huge fan of 30 Rock. It might be one of the few “new” things I appreciate in this ever changing world. I’m pretty certain I was born middle-aged and have never really been able to relate to what young people find interesting: loud music, wacky clothes, and radical thinking. Therefore it’s only natural that I should look upon Liz Lemon as a soul mate. As the semester unfolds and picks up speed, I find this scene playing repeatedly in my mind. In this episode Liz feels slighted by her writers since they like to hang out together after work and don’t invite her. Jack suggests that Liz hang out with him, her professional equal. To which Liz mimes pouring a drink from an imaginary bar, dropping the glass, and then sweeping up the pieces. This resonates with me on many levels and I can’t really say why. Do I feel like a monkey miming through my life most days? Yes, I guess I do. Do I feel that my life is a series of performances? Yes. It’s the second still that really summarizes how I feel most days. And since I don’t really drink alcohol anymore, the fake cocktail is pretty accurate, too. 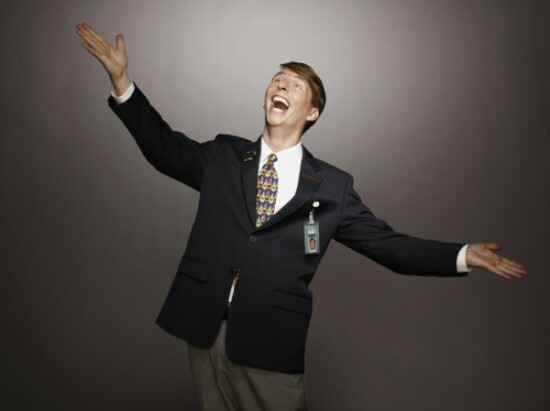 Other days, I identify with Kenneth Parcell. Upbeat, wholesome, and naive. Do some people underestimate me because I’m nice? Sure. Do I care? Not really. That’s their hang-up and life is too short to be bothered. In the end, he’s the one having the most fun on that show.